Buying body wash at the store can get to be expensive. This page contains homemade body wash recipes. I like this because it works just as good as the fancy stuff and the ingredients are super cheap. add canola oil to shampoo. Mix without making bubbles, and add the essential oils and food coloring (optional). Then add the baking powder and the baking soda, and lastly mix in the salt. Pore into a a bottle and apply with a tulle sponge (or any sponge) and enjoy! This is something I came up with a few weeks ago and I love it! Very frugal, costs about 25 cents to make and it goes a long way. Great for large families who go through too much shower gel. 1/2 cup organic dishwashing liquid (I used a grapefruit bergamot essential oil one) - use one that biodegrades within 30 days. Idea - I am going to try adding some honey or agave instead of the lotion next time just to see if that will be a good option as well. Would be nice to have different combinations! If you are using everything unscented in your recipe, feel free to add a few drops of your favourite essential oil to it or keep it unscented if you prefer. Pour the soap, lotion, glycerin and dish liquid in the bottle then top off with water. Close and shake slowly to mix. I like to leave a little room at the top so the liquid can mix. Squeeze a little onto a bath "pouf" and wash! This tends to make a nice bubble bath too. I will be making this for visiting backpackers through couch surfing.org for the bathroom downstairs. This is great if you have a lot of people using the shower and you're going through shower gel like crazy. These days you can get all kinds of yummy scented dish liquid. I have a nice organic ylang ylang and grapefruit one that I found on sale for $1. 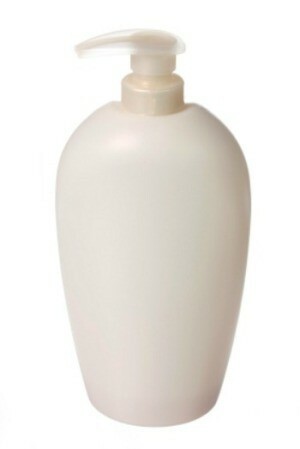 Unscented lotion can be found at dollar stores. Even if you use a higher end one, making this will still be less expensive anyway. Make a lovely antiseptic body wash by adding a few drops of tea tree essential oil to your shower gel or foam bath. Shake it well and enjoy! My homemade body wash came out runny. How can I thicken it? I'd love your recipe for body wash please! I don't have experience with making body wash, but you can possibly dump it into a larger container and add more glycerin (or whatever you used as a base) until its the thickness you want. Of course, you will have more product, but its all I know you could do unless you buy thickening agents. We would Love to have your receipe for your body wash please. I love this body wash. It is frothy and foamy with a sponge. Try it! It works great. Always do a test patch because some skin types can react differently to other ingredients than others do. Mix all ingredients and use with a sponge. For best results disolve baking powder and baking soda in 1 tbs of very hot water and poor all of it in including the water. Does anyone have a recipe for body wash? You can use just a plain shampoo that you like. Lots of ladies I know who are sensitive to different things use a basic shampoo that they like and it works wonderfully. The shampoo I get for Hubby is a hair and body one so go figure. Can I make homemade bodywash from leftover soap pieces? You can put the leftover pieces in a pot with a little water then put the pot on the fire. When the soap gets soft, pinch them together, let it try. Milk shower for silky and strong hair and soft skin. Take 4 cups of milk to rinse. DO NOT USE WATER FIRST. Use regular shampoo and rinse with MILK to get shampoo out. Take 2 cups of milk, mix with brown sugar for a scrub and clean body. Rinse with milk. Warm milk as needed and let it cool before using. Tips: Leave in milk for 5 minutes in hair and massage hair good for the milk vitamins to help hair. Goat milk is great too. Source: Grandma "Mariaelena" As a child, she used this method to shower her hair but with NO SHAMPOO and her hair. As I did it over the years, my hair is STRONG, VERY LONG and shines with no chemicals or effects and natural product.